For His Lovingkindness is Everlasting. | H. Jim Keener, B.A., M.Div., Ph.D.
Last fall I took a look at the inside of a fresh new rendition of the King James Version–The New Cambridge Paragraph Bible. I found it to be a strangely successful combination of seemingly contradictory impulses–refreshingly innovative in terms of its paragraph style layout, yet radically dedicated to the preservation of its ancient source in terms of its reconstructed text. So much for the contents; but what about the construction? If David Norton has sought to restore the KJV as a fine art renovator might restore a valuable painting, how has Cambridge framed the revitalized masterpiece? far the most flexible Cambridge Bible I’ve reviewed, although their edge-lined Bibles are likely to be just as flexible or perhaps more so. 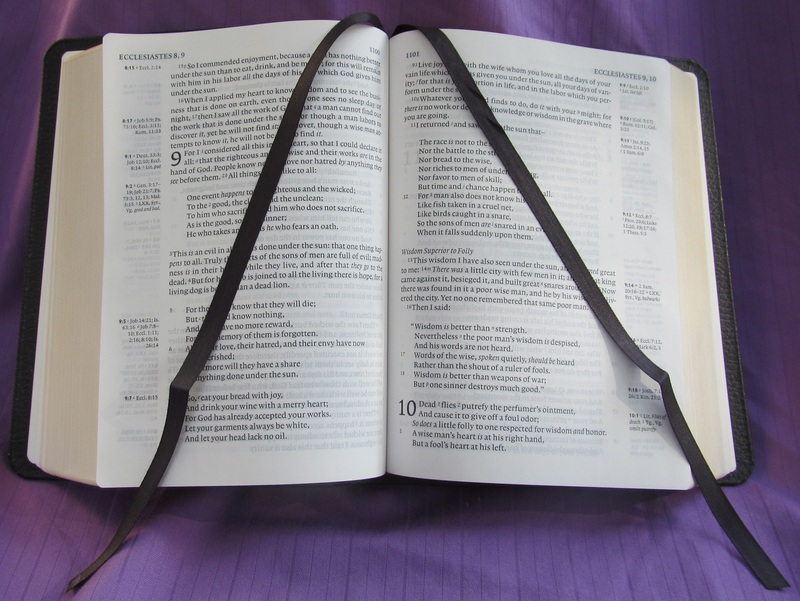 This is good for a personal sized Bible like this, as a flexible cover can be more manageable, easier to handle, and more pleasant to the touch than a stiffer casing. The calfskin here is certainly soft and pliable in the hand. Yet, I’m not sure this is an unmitigated benefit. The floppiness seems to result from a combination of a thin leather cover and thin end boards. I’ve not subjected this Bible to my usual crucible of abuse–I treat this one gently because of the cultural and historical significance it holds. I wonder how it would hold up to such harsh treatment. Anyone with first hand experience out there, please feel free to leave some comments below about how your cover has fared! I was also surprised that, unlike the Clarion calfskin Bible, this edition does not have art-gilt edges–although this really shouldn’t be a major issue, in my opinion. Right: NCPB; Left: Clarion. Note the difference in the page edges. Top: Clarion; Bottom: NCPB. Notice again the page edges. NCPB inside cover. If you look closely, you can see some of the rough edges on the endpaper. Turning to the inside of the cover, in his review, Mark Bertrand noted several imperfections that, along with similar issues he had detected in another Bible also bound by L.E.G.O., led him to conclude that “L.E.G.O. still has some work to do in the quality control department.” I was curious as to whether I would find the same issues that he had found; perhaps he had gotten a “lemon.” Unfortunately, I did notice the rough cut of the leatherette paper where the leather attaches to the inside of the cover. This is certainly a very minor point, and I would not say that it is a reason not to buy this Bible. Even so, it seems to reinforce Bertrand’s conclusion. The first page of the apocrypha section of the NCPB. As for the paper, however, I am happy to report that I have found no problems. The paper is opaque enough, considering how thin it is, and the font is bold and crisp, with no broken letters that I have detected. And no page curling. Turning to the inside, this edition follows its larger, higher-end goatskin cousin in including the notes of Norton and the KJV translators (unlike the paperback edition), and it puts these notes on the inner margin. While I personally prefer having any annotations on the outer margin for both aesthetic and pragmatic reasons, it seems that most people prefer to have them on the inside, to guarantee that the text of the Bible itself will not creep into the gutter. 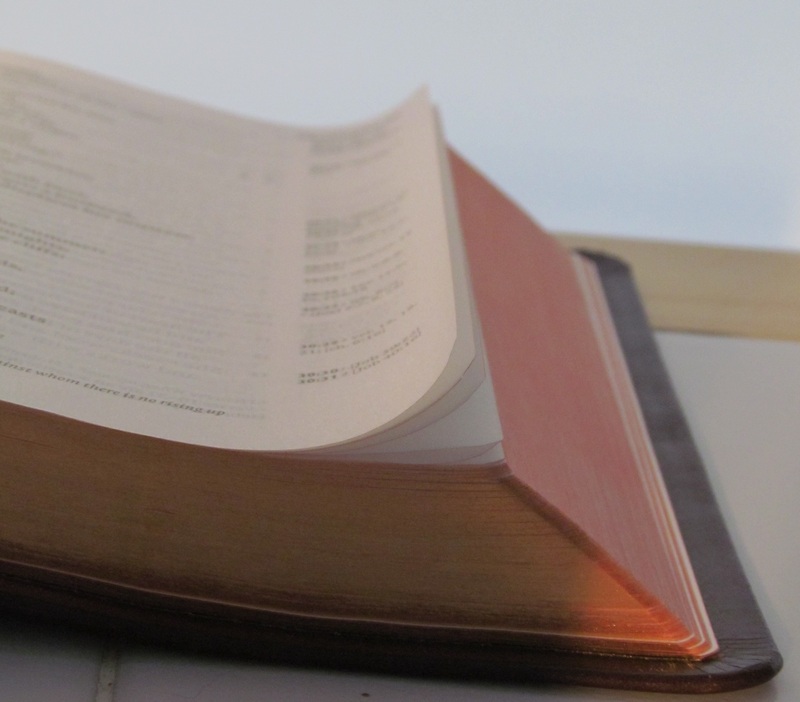 For example, one thoughtful commentor on this blog, Brett, says this is a deal breaker for him and that he will not buy a Clarion Reference Bible because of its placement of the references on the outside. For my part, I find the inner-margin annotations to be odd, counter-intuitive, and even sometimes ugly, but I am almost certainly in the minority on this. And, on the whole I can live with the inner-margin decision, and the fact that the notes are included in a place where they are easy to find is the key. So it would seem that Cambridge has made the right choice here. Behind: Cambridge NCPM. 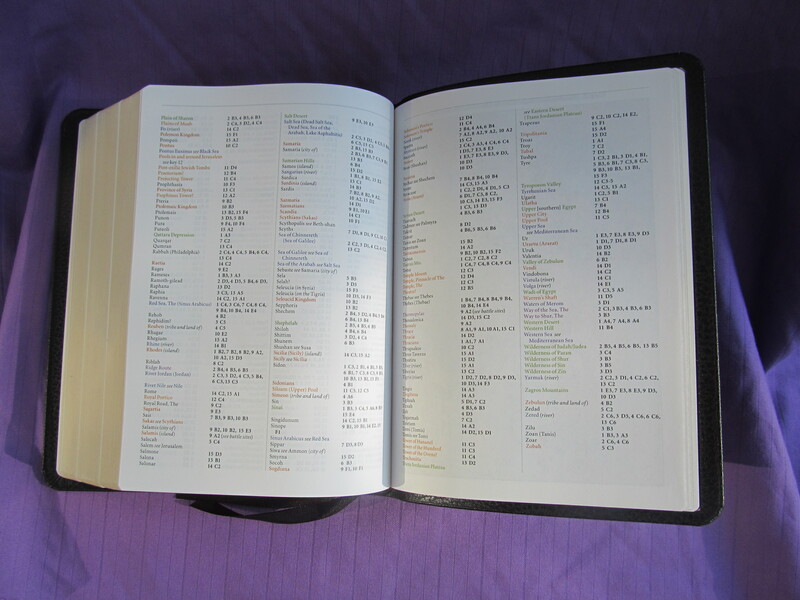 In Front: Crossway ESV Personal Size Reference Bible. Notice that both put their annotations on the inside, in the gutter, unlike the Clarion. Lest some of the negatives I’ve noted so far deter you from considering adding this Bible to your library, let me leave you with a couple of things that I think Cambridge/L.E.G.O. have gotten right here. First of all, I absolutely love the slip-case that the Bible comes in; this allows you to protect the Bible while also enabling you to store it on a shelf as you would a hardback. I wish all Cambridge Bibles still came in a slip-case. Then there are those red ribbons. Again, this is a matter of personal taste, but I prefer this look aesthetically to the standard monochrome black-on-black. What makes this Bible especially noteworthy, in my opinion, is the way that it combines several seemingly contradictory elements together. In terms of its content, I’ve already discussed how innovation and ad fontes traditionalism run fluidly together. In terms of the overall construction of this particular calfskin, personal size edition, the Bible turns out to be, at turns, a scholarly reference work, a significant historical piece, a usable personal size Bible, and a finely constructed little volume. In other words, if you buy the larger goatskin edition, you are investing in a museum piece that looks beautiful on the shelf. If you buy the smaller paperback version, you have a Bible that you can grab and carry with you to read–but not likely to hold up for long. If you buy one of the hardback copies, you have a library piece, good for reading and reference, but perhaps not so great to take out of the study. With this personal size caflskin edition, you have a beautiful volume that looks lovely on the shelf, is suitable for reference, yet also serves well as a portable Bible you can carry with you and read anywhere. Addendum: One more note on the content. In my previous post reviewing the contents of this beautiful volume, I neglected to note one thing of interest: This edition of the KJV omits the italicized words included in most KJV editions going back, as I understand it, to the original printing. This is viewed by Norton as a stylistic decision, part of the “renovation” process, but it could also be seen as more than merely stylistic–something integral to the translation has been removed, one could say, by the omission of this indicator of which words are in the original languages and which are not. How is the calfsplit leather? On the whole, I really like this cover, more than I expected to. It has a nice leather scent to it out of the box, and it appears to be thicker and sturdier than its slightly pricier cousin, the brown calfskin. Cambridge situates their calfsplit option between calfskin and french morocco in quality but, honestly, I almost prefer it over the thinner calfskin on the ESV Clarion and KJV NCPB. The downside is that the calfsplit is much, much more stiff, as the pictures below show. The calf split NKJV Clarion perched atop its box. Notice the almost complete lack of floppage. 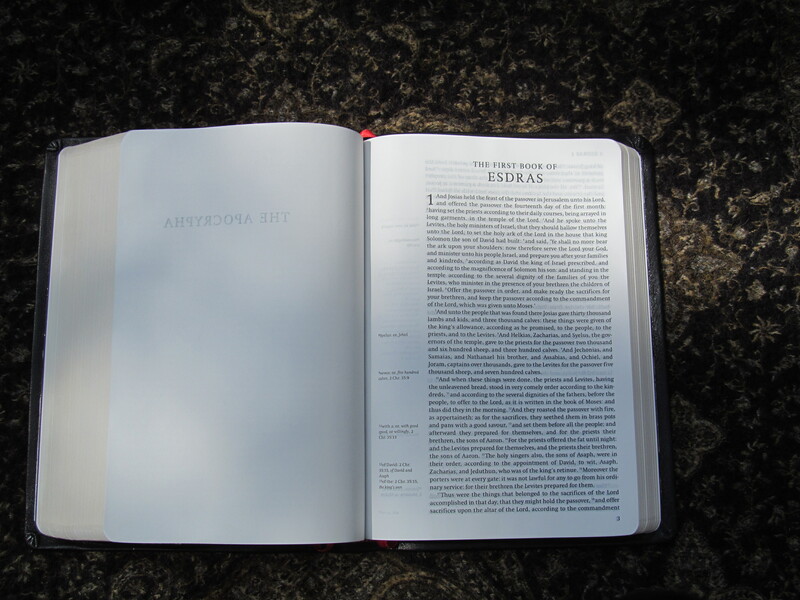 The calfskin ESV Clarion Reference Bible in the same pose as the NKJV–well, sort of. To be fair, the ESV is a year old and has been well broken in. 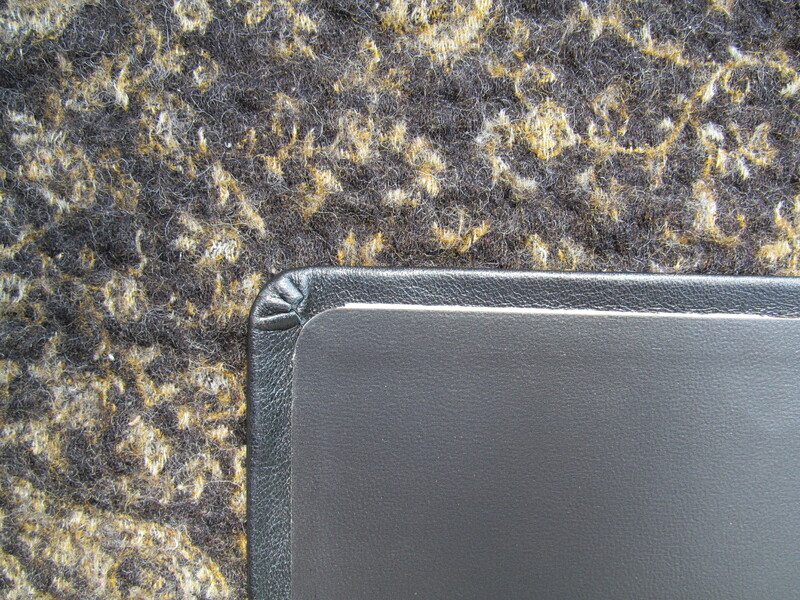 Even so, the calfskin leather was much more flexible out of the box than the calf split. 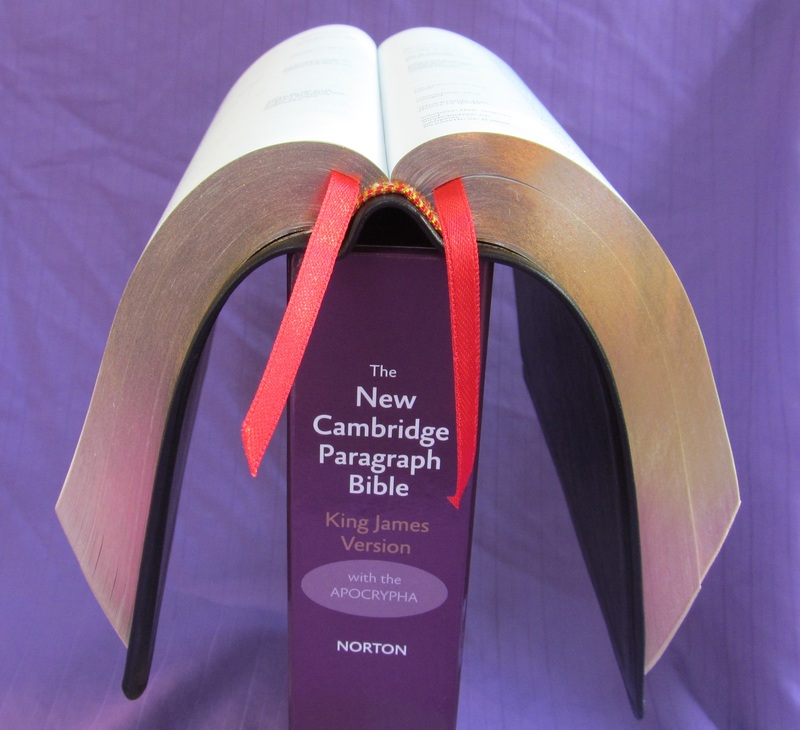 The New Cambridge Paragraph Bible in calfskin in the same pose. This Bible is by far the most flexible of the three. As a result, this question is impossible for me to fully answer right now because of the way that stiff Cambridge leather casings have a tendency to loosen up with time and break in beautifully, the way other leather products built to last tend to do (think: leather construction boots or the baseball mitt that eventually conforms to the exact shape of your hand). I imagine (but can’t know for sure) that the calfsplit leather will break in beautifully. Here the calf split Clarion NKJV is in its clamshell box. If you zoom in on this picture, you can get a good idea of what the grain looks and feels like. If this is the case, then I would probably rank the calfsplit casing edition as the preferred option of the Clarion Reference Bible, all things considered. The goatskin edition, which is certainly much nicer, I’m sure, and much more flexible given that it is the only edge-lined option, retails for a full $90 more than the calf split option. In my opinion, that’s a big chunk of change, especially when you are tacking that $90 onto an already hefty Cambridge price-tag, where even imitation leather copies don’t come cheap. 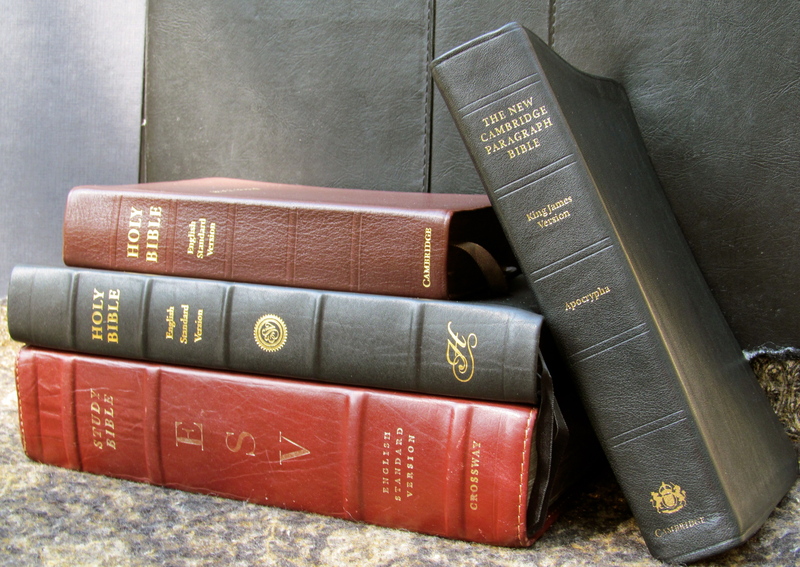 The calf split leather may not be on a par with the goatskin, but it is leagues better than the “genuine leather” Bibles you are going to find in most bookstores. For the price, this may be the best option. Does anyone out there have any extensive experience with one of these calf split Bibles from Cambridge? If so, please share below how well it broke in (or didn’t). Here’s the NKJV open to a page with both poetry and prose sections. You can get a good look at the line matching on this page, which seems to me to be executed better than it is in my ESV Clarion. Also, you can see a very slight curl of the page, encouraged by a slight breeze during the photo shoot. Really, the page curling is a non-issue with this Bible, which far outshines the ESV in this regard. The short answer is: I really didn’t see any, or at least nothing comparable to the widely reported issues with the ESV Clarion. Again, line-matching is where the lines on each side of a page match up, and this tends to make reading easier because it cuts down on ghosting (or bleed through). 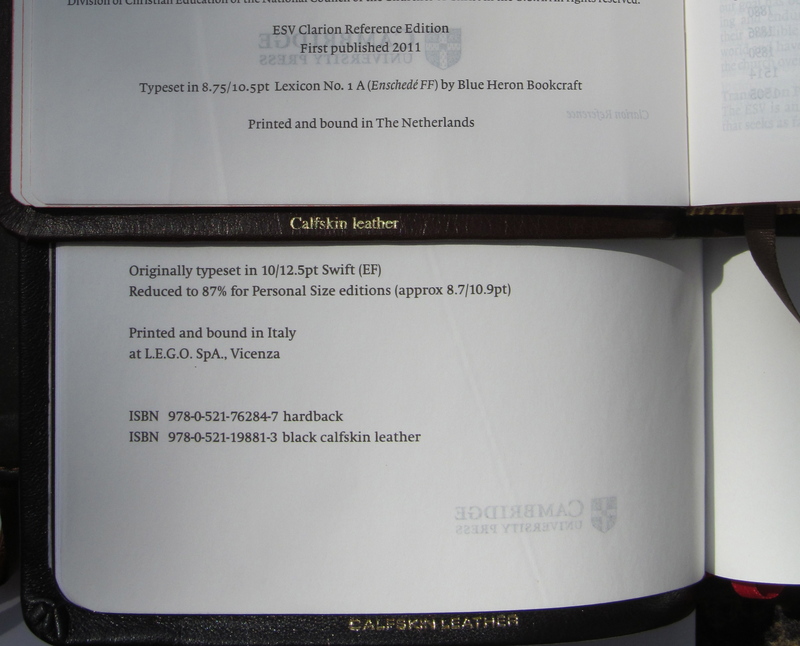 As I recently reported, Cambridge has detected some less than perfect line matching on their ESV Clarion and intends to make it better with the next print run. It’s important to know how well executed the line matching is because it is a big part of what is supposed to make the Clarion special, with a print that is unusually clear and large for the Bible’s size. A full report is beyond my ability to give. However, I did take the time to read a substantial chunk of this Bible, often comparing it with my ESV Clarion. I came away with the distinct impression that somehow the NKJV edition was clearer and easier to read, and that I saw less grey-haze seeping through the page when I looked at it at a glance. So, my impression so far is that the line matching has been executed quite well. 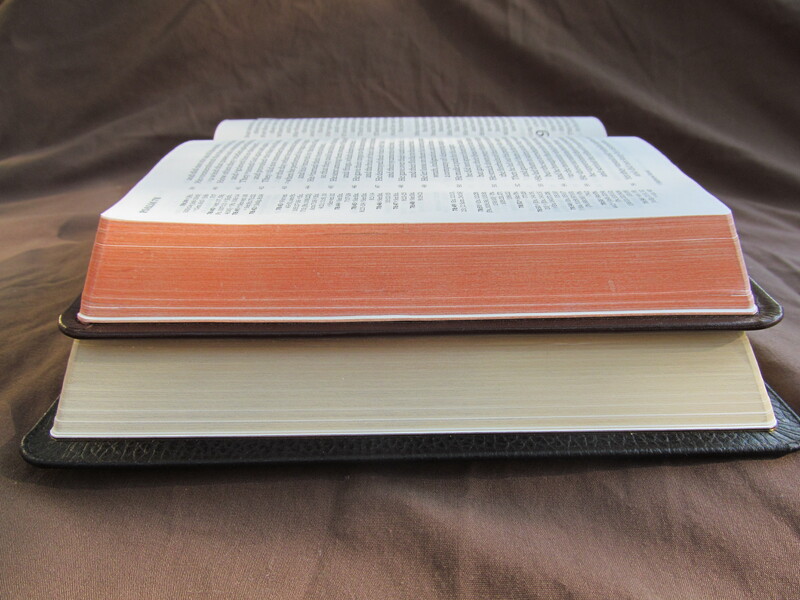 In any event, the Bible is indeed quite readable for its size. 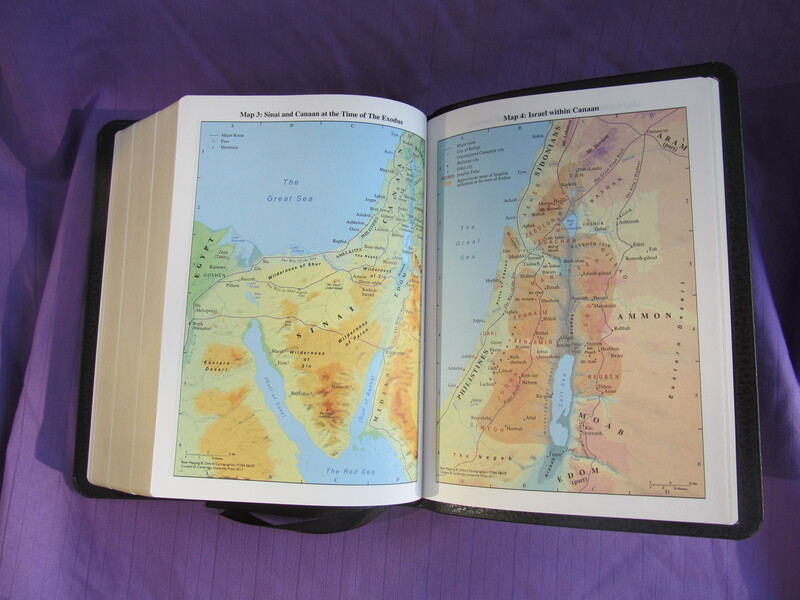 The Cambrige maps found in the NKJV Clarion Reference Bible–different from the Moody Bible Atlas maps found in the older ESV Clarion Reference Bible. 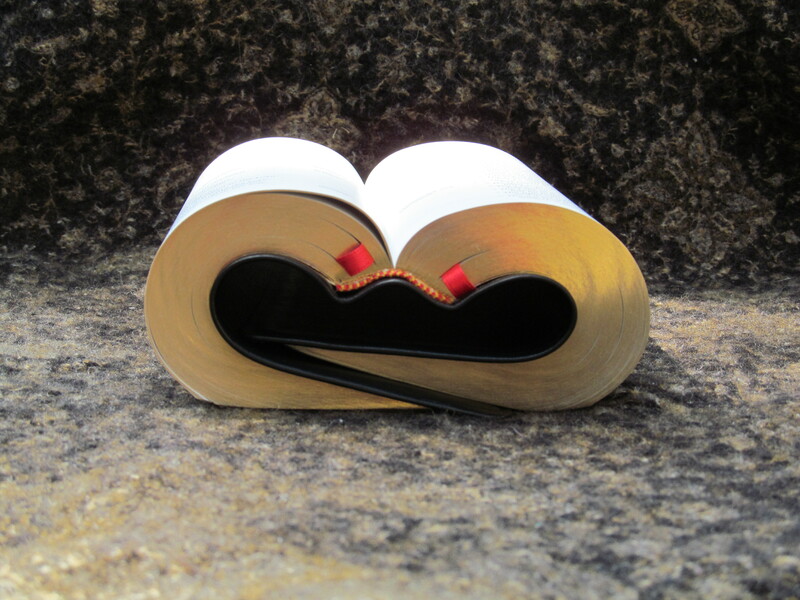 What else makes this Bible different? First of all, like the latest ESV Pitt Minion Bible, the NKJV Clarion uses the new maps that Cambridge seems to be switching over to, not the old Moody maps. I would guess that all future printings of the Clarion Reference Bible will have the newer Cambridge maps. No one set of maps has any clear advantage over another. As for the calfsplit edition, it is distinct in that it does not have the art-gilt page edging. Art-gilt edging is nice, to be sure, and may help justify paying the higher price for the calfskin or goatskin edition. This, again, is a matter of personal preference, and you’ll have to decide if it’s worth the money or not. guess that all future print runs of Clarion Reference Bibles will do the same. In the long run, as I’ve noted before, the costs and benefits involved in this trade are about equal, and most purchasers aren’t even likely to notice the difference. 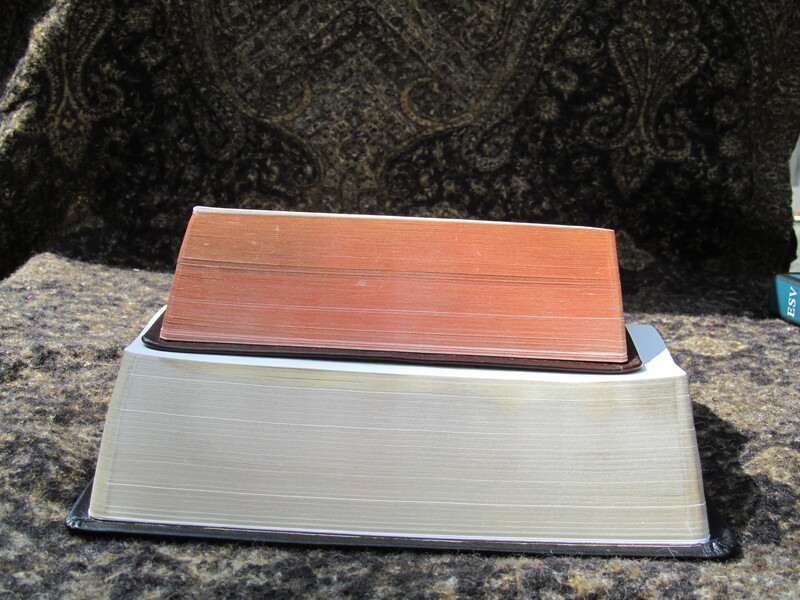 Top: ESV Clarion in brown calfskin with art-gilt page edges. Bottom: NKJV calf split Clarion with gilt page edges. 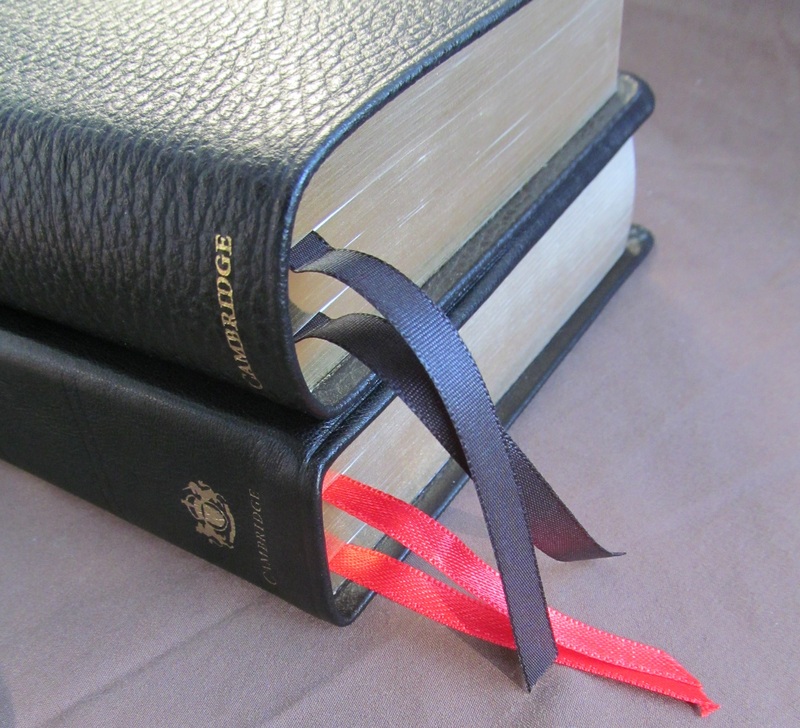 Finally, I’ll note (in the nit-pick category) that I’m not enthused about the choice to use black ribbons, where the black goatskin edition has red ribbons. Some people will prefer the more demure black on black monochrome. For my part, I like to see either red or purple with black. Top: Calf split clarion with black ribbons. Bottom: Calfskin NCPB with red ribbons. The calf split, again, feels somehow sturdier, if also much stiffer, than the calfskin. On the whole, though, I am quite pleased with this edition. Problems associated with the ESV edition–line-matching and page curling–are not to be found here to my eye. Surprisingly, I really like the calf split leather, which is thicker and maybe sturdier than the calfskin cover. And, not insignificantly, it is the most affordable option available. Considering all of these things, I would recommend this Bible to NKJV readers looking for a nice, sturdy, single column reference Bible. 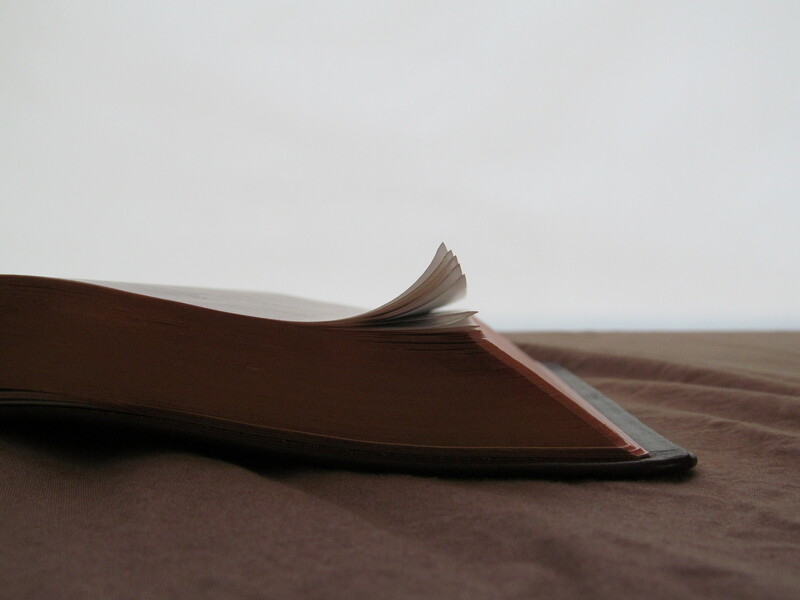 It seems that the edges of the pages tend to curl inward on many (but not most) copies of the ESV Clarion Reference Bible. The issue has decreased with use for me, but it took a while and never went away 100%. A quick snap of the page curling from a slightly different angle. 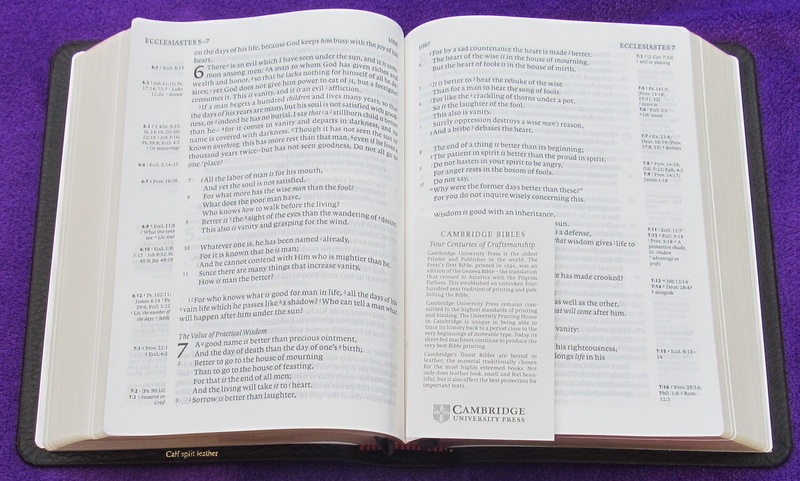 1) Will Cambridge replace my Bible with a new one if I don’t like the way the pages curl? The short answer: No. 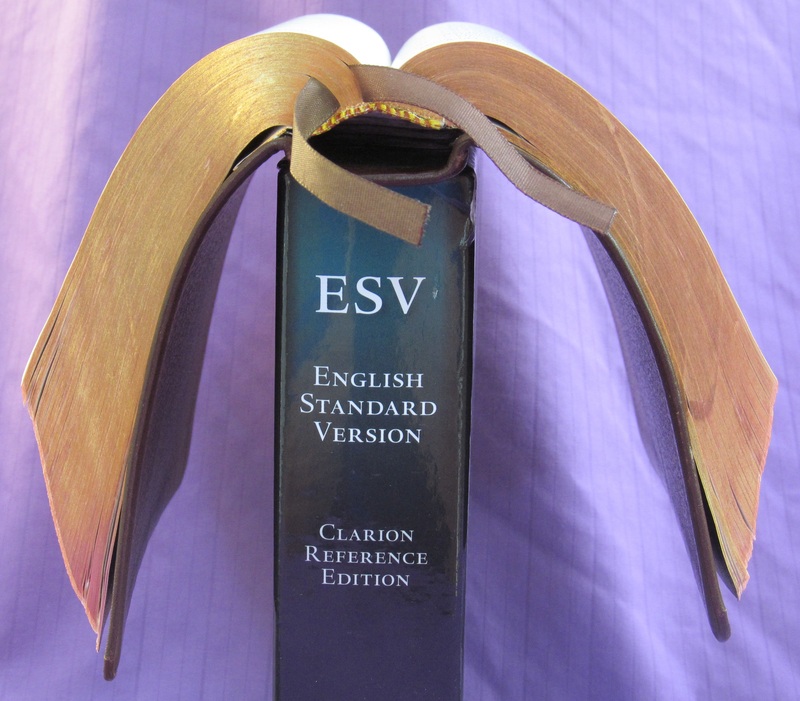 Although the tendency of pages to curl at the edges has been commented upon frequently enough by owners of the ESV Clarion to warrant some attention of both Cambridge and their printer, it is not a defect for several reasons (it does not impair reading, thin Bible paper is susceptible to such things normally, there was no failure in the printing process that produced it, it is thought to diminish with use, etc.). Therefore, It is *not* true that Cambridge counts this as a defect and will replace every copy with another Bible from a second run upon request. Moreover, not all Bibles were affected; in fact, I get the impression that customer feedback seems to indicate that most Bibles were not affected. 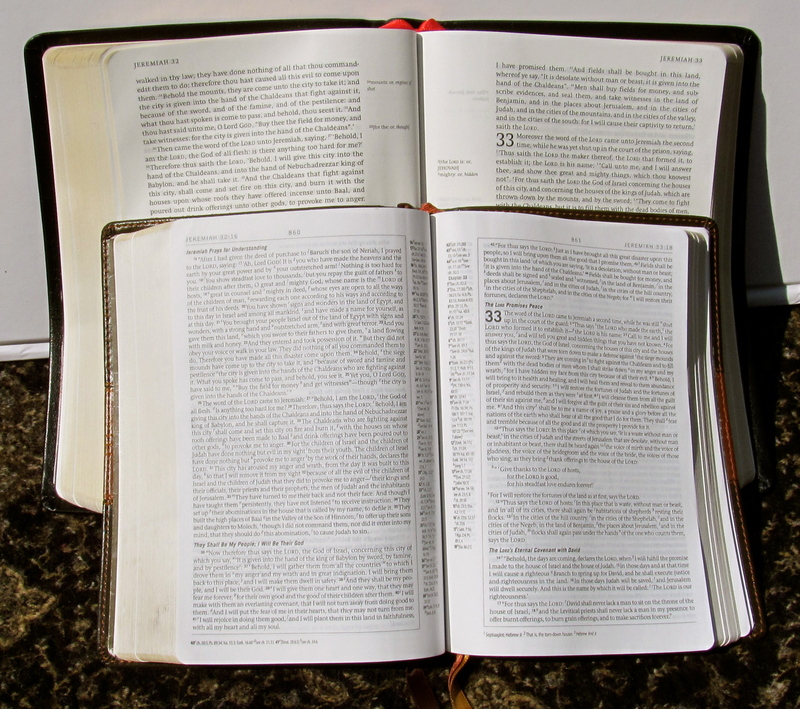 2) So, what’s the deal with the first print-run of Bibles in the UK? The answer to this question was a bit more complex. Evidently, Cambridge was informed about the 2011 ESV text revisions late in the typesetting process when page numbers were already fixed and this resulted in some last minute scrambling resulting in a typographical error and having some effect on line matching. There was no “recall,” but the distribution was stopped once the typo was discovered–within days. Very, very few of these Bibles made it into circulation anyway, and those were only sold in the UK, not via Baker in the US. 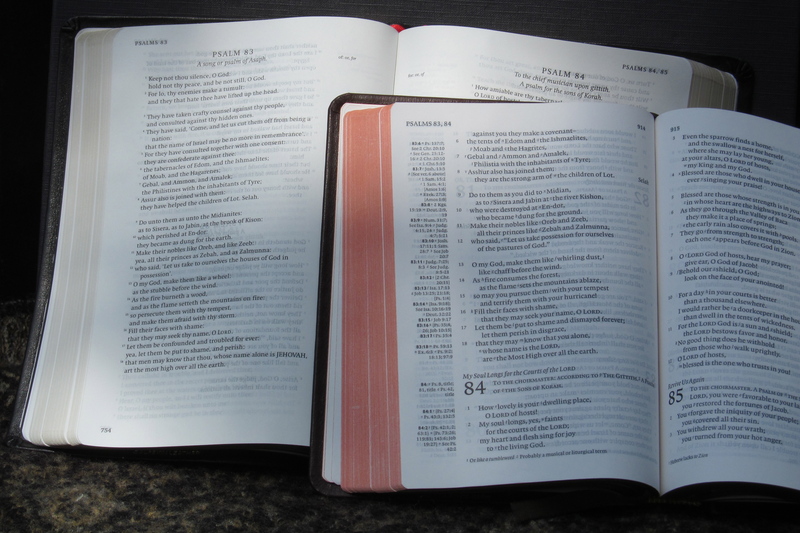 The typo was corrected–which accounted for the delay in distribution that some people have described as a “recall”–and no ESV Clarion Bibles purchased today through Cambridge in the UK or Baker in the USA will have the typo. 3) So, how’s the line matching on the ESV Clarion? 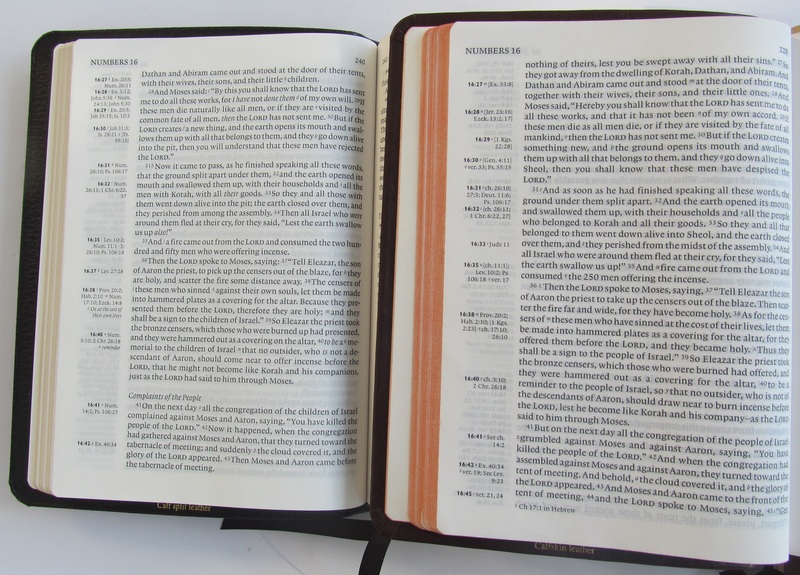 Line-matching refers to the way that some Bibles are printed so that the lines on each page match up with the lines on the back of the page to cut down on bleed through and enhance clarity. Potential ESV Cambridge Clarion customers commenting in several forums say that they want to know how well this has been executed in the ESV Clarion. For my part, I’ve not found the line matching to be problematic on my ESV Clarion, which I have used quite a bit (although I’ll return to this question in a future post reviewing the new NKJV Clarion). Nevertheless, Cambridge has been ever vigilant in looking for ways to make a good thing better. So, for the second printing, the inter-line spacing has been adjusted and therefore the line matching will be improved. I’m not sure when that second printing will be. Also, the gentleman I corresponded with asked that I summarize our correspondence in my own words, rather than simply directly quoting him at length; it is best if Cambridge reps can avoid getting directly entangled in the quagmire of trying to explain complex and sometimes confusing publishing issues via the blogosphere. This makes sense to me, and I totally understand where he is coming from. So, dear internet interlocutors, it would probably be best if you do not directly cut-and-paste lengthy e-mails from publishers in general, and certainly from Cambridge in specific, unless you have explicit permission from a representative to do so. I am very grateful to the Cambridge representative who took the time to respond to these questions. I hope that this has been helpful for those of you who are wondering. I have recently received a review copy of the black calf-split NKJV Clarion Reference Bible from the good people at Baker. I am really excited to tell you what I think about this Bible, so I plan to post a review in the next week or so. 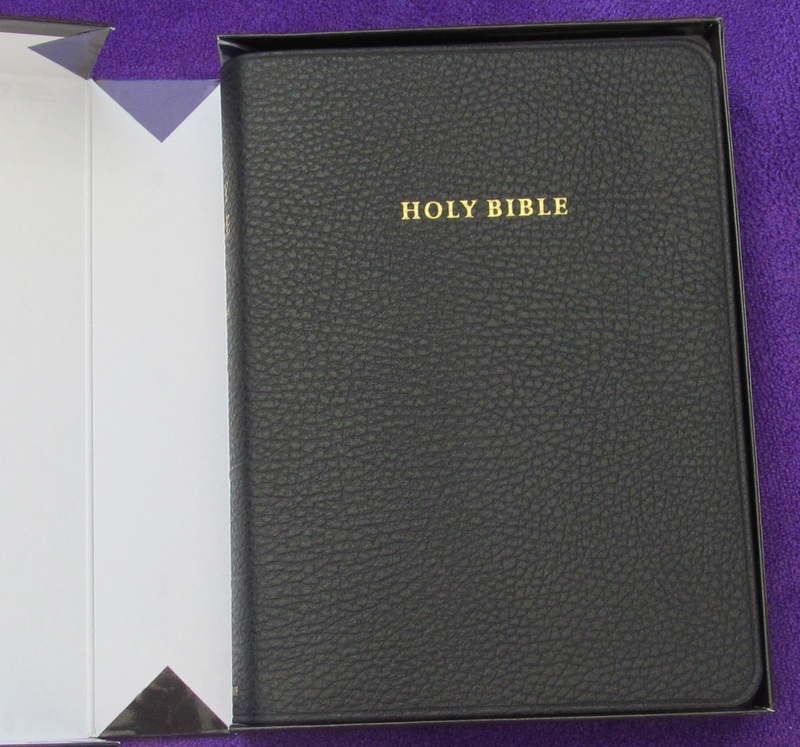 Also, Some aeons ago, I set out to write a two part review of the personal size KJV New Cambridge Paragraph Bible bound by Lego in Black Calfskin. So far, I have only published the first part of that two part review. I plan to finish the second part of the review soon. I’ve written in the past about the lament psalms and how they teach us to pray honestly. I am increasingly convinced that the church needs to learn to pray honestly, now more than ever. In our 21st Century middle-class American context, Christianity is often slickly marketed and neatly packaged, leaving us with entertaining but sugar-coated and superficial answers. It’s inevitable that, after a while, we expect our Christian experience to look like the praise team in our church–attractive, energetic, and above all, always smiling. As a result, when our life experience looks more like a Shakespearean tragedy than a 30 minute TV sit-com, we don’t know what to do about it. We’re not sure how to pray, and we may even be fearful that God will be angry if we are honest with him about how we feel. The Book of Psalms models for us a kind of prayer that is brutally honest, and I personally find the example we see there to be refreshing. Today, I had the privilege of preaching on Pss 3 and 4 and their example of honest prayer. I’ve linked to the sermon and an accompanying powerpoint on my sermon links page. I invite you to listen to my sermon, and I pray that you will be moved by it. I believe that this simple message–that we can pray honestly, without a facade–can be transformative, because honest prayer opens us up to a transformational encounter with God. I pray that God will use this in your life. And please leave a message for me here if you do. I’ve always thought it would be cool to buy some leather and “hack” out a DIY leather-covered Bible or journal, or maybe even a book. 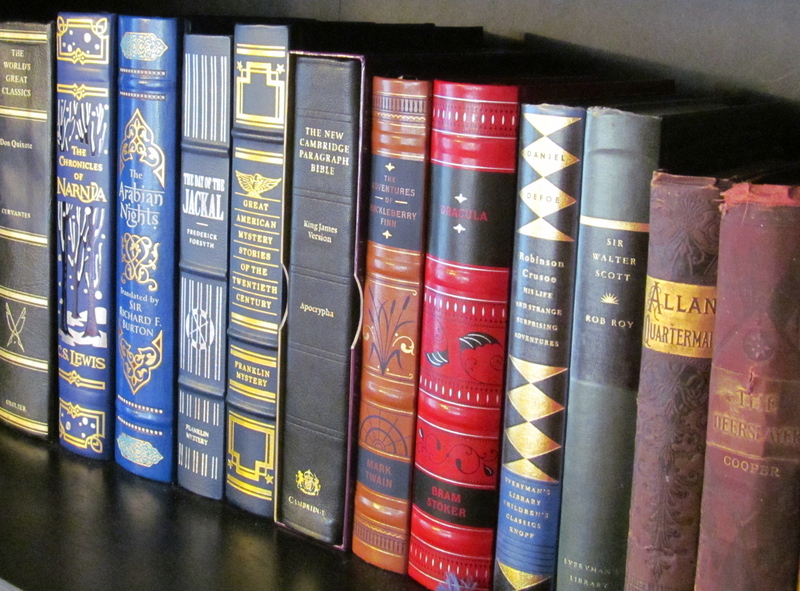 Granted, If you want the finished look of a Cambridge Bible or an Easton Press leather-bound book, you’re not going to be able to pull that off without a steady hand and some training and experience. But what about a useful, durable, pleasant to hold, floppy cover? I mean, how hard can it be? You just tear off the cover from a hardback copy, cut out some leather to the proper proportions, buy the right glue, let it sit, and voila! A masterpiece! Right? Well, I certainly lack a steady hand. And, experience? The only leather-work I’ve ever done involved weaving together a pre-fab wallet in Cub scouts when I was in fourth grade. And even that wasn’t pretty. So I’ve never had the guts to try. Now that’s cool! Geoff7519 shows us how to do it all on our own! Of course, I’m still not brave enough to try it. I have to be honest, I’ve only even made it through the first video so far. At about a minute and a half in, when he broke out all the tools, I knew I was already in over my head. But, I decided to share anyway, because I’m sure that there are others out there reading my blog who are good with their hands (unlike me) and geeked about leather covers (just like me). If anyone else has done a DIY Bible or book rebind, or constructed a leather journal, or done anything along those lines, go ahead and tell us about your experience. And feel free to point us to more helpful DIY resources that you might know of! OK, so I admit I’ve been on a blogging hiatus recently. I’ve been quite busy, with a new addition to my family, several publications in the works, and of course a wonderful but sometimes quite demanding job. did an Internet search the day after Christmas and found a Post-Dispatch story about a special Bible stolen from St. Johns Lutheran Church just days before Christmas services. He called the police, and soon the Bible was restored to its rightful owner–St. John’s Lutheran Church–and the thief caught. Joan Potvin, the Church Secretary, received the Bible from the police. Happy New Year, all! Here’s hoping that 2013 begins with good news for you, as it did for St. John’s Church!